We have another great color story this week at The Play Date Cafe. Our colors are Cobalt, Goldenrod and Peony. 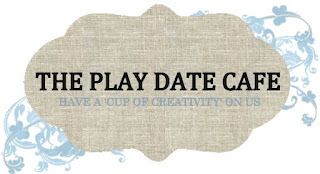 Over the past few day The Play Date Cafe has been welcoming and revealing the new designers who will officially start on the team next week with our August 2 Challenge. However, we are also sad to say goodbye to Savannah, Colleen, Jinny and Denise. They have all been here so long and will be missed. I know we will all continue to visit their blogs and support them in their future endeavors. Since it's so hot here, I thought I would do a summer card. The paper is Pacific Point, Daffodil Delight, and Whisper White from Stampin' Up. The cork is also from Stampin' Up. All the stamps and dies are from Papertrey Ink - Heart to Heart #6 & Flipping Out. I stamped the sentiment using Versafine Archival ink. I hope you will join us this week and make a project with these fun colors! I can't wait to see what everyone comes up with! And, one lucky winner will get a prize from the fabulous Play Date Cafe prize vault and trust me, it is filled with crafty goodness! Soooo much fun Donna! Love those polka dots! Super cute, girl! LOVE that cork sand, and those flip-flops are beyond precious! Super perfect for summer. Love those flip flops! love the flip flops, cool summer card! Wonderful beach scene! Those flip flops are so cute, I love the blinged flowers. This is fabulous, Donna! 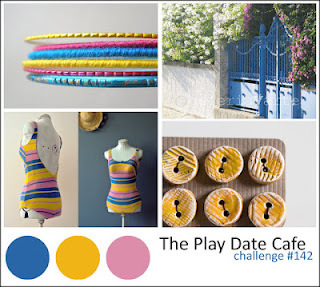 I love the primary colours and the cork beach is super cute. Thanks so much for stopping by during the Paper Smooches August Release Hop! Those skippers are just too fun!!! Those are the coolest little flip flops. My girls would love A real pair of them. Blessings! This is so cute! I love the bright happy colors and those clouds are adorable. The sandy beach is perfectly done too. Great card!